Almost every EV in production today has one thing in common—lithium ion batteries, from the Tesla Model 3 to the Nissan Leaf and Jaguar I-Pace. As the EV market gets more competitive, automakers have started benchmarking charge times to only 80 percent. Why don’t they advertise how long it takes to fully charge? The latest electric cars can achieve most of their charge in under an hour—Jaguar claims the I-Pace takes just 40 minutes for an 80 percent charge with high powered DC chargers. 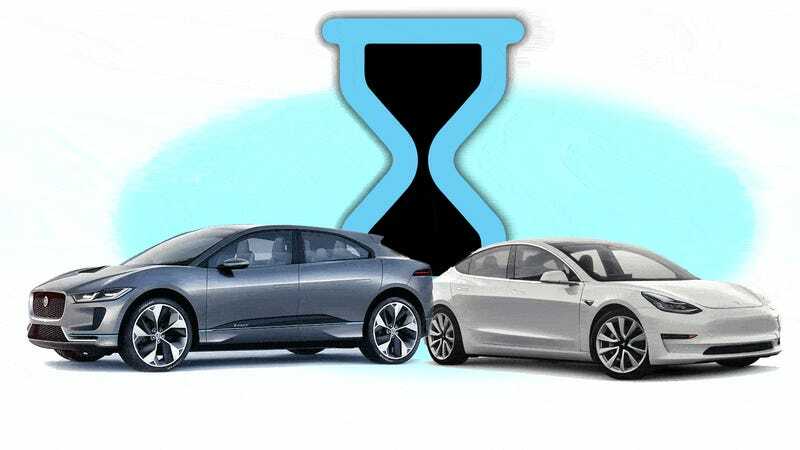 But most companies, including Tesla, Jaguar and Byton, avoid quoting the time it takes to fully charge an electric car, because it takes disproportionately longer to charge up that last 20 percent of capacity. Since Jaguar was making a big deal about its new I-Pace electric crossover this month, I decided I would figure out exactly why lithium-ion batteries charge quicker to 80 percent and slow down beyond that point by going to the people responsible for engineering the I-Pace. But first, we should probably go over the basics of how a lithium-ion battery charges and discharges before getting into its quirks. Lithium-ion battery cells, on the outside, look pretty similar to the batteries you use in any other device. On the inside, they contain an electrolyte solution and a separator. The electrolyte is what gets the lithium ions to move around and the separator is what prevents electrons from moving around anywhere but through the circuit, which is where they need to go for the battery to work. On opposite sides of the separator is either the cathode, which is positive, or the anode, which is negative, just like on any battery you’ve jammed in a remote. For a lithium-ion battery, the cathode and anode is where the lithium is located. Multiple sheets of cathode, anode and separator materials are stacked inside the cell, and the car’s battery pack is made up of hundreds of these cells. When a cell is charging, positively charged lithium ions move from the cathode to the anode through the electrolyte and stick to the surface of the anode material, which is typically porous graphite. The electrons, now free from the lithium molecules, move through a closed circuit in the same direction, from the cathode to the anode, and naturally rejoin the lithium ions, kind of holding them in place. Once the cell is charged, the electrons holding the ions in place on the anode don’t want to be there, but they don’t have any way of moving back to the cathode because they can’t move through the separator. They have to wait until the circuit is reconnected during discharging to get back where they came from. When that happens, the electrons move back to the cathode through the circuit, which is what generates the useful current, and since they’re no longer holding the lithium ions in place, those move back through the separator to the cathode, too. With that super simplified explanation out of the way, let’s get into why lithium-ion batteries are typically quick to charge to 80 percent using DC fast charging, and why they slow down significantly afterwards. The primary reason charging has to slow down beyond the 80 percent benchmark is voltage. For the Jaguar I-Pace’s lithium-ion battery cells, the natural voltage of the cell when depleted is around three volts, and the maximum charge voltage is 4.2 volts, according to Steve Boulter, Vehicle Integration Manager at Jaguar. The limit is typically based on the chemistry of the materials used in the cell, but most lithium-ion batteries have a max between four and 4.2. Clarification: Edited to clarify that “natural voltage” is meant to represent the voltage of the battery when it is depleted, which is 3 volts. Nominal voltage of each of the I-Pace’s cell groups is 3.6 volts, with 4.2 being the maximum voltage when charged. For the I-Pace’s 90 kWh battery, there are 432 cells that total around 450 volts when the battery is fully charged. Most public fast chargers are high powered with around 480 or 500 volts to provide a greater voltage between the charger and the battery. As an individual battery cell’s charge voltage gets nearer to 4.2, the cell’s resistance increases and the current flowing to the battery has to be reduced to ensure you don’t exceed the max. This necessary reduced rate slows down the charge time, which is why the last 20 percent of a battery’s charge capacity typically takes so much longer to fulfill. Boulter told me to think of the moving ions in a lithium-ion battery that’s charging as people, and the anode is a stadium. The first people to enter the stadium have the pick of the seats, which represent the porous graphite in the cell. The current is high and the people are rapidly piling in. However, each later person entering the stadium has a harder time finding a seat. The issue is that, for a lithium-ion battery, trying to keep the rate of ions, or people finding seats, the same gets harder as the seats fill up. The very last people will have to bump around and move quicker to find a seat and maintain the same rate of entry. In a battery cell, this is where things could get problematic and there’s potential for the temperature to increase and the reaction to become unstable. So, you have to slow the rate down, which slows down the charging process. If you go over the maximum charge voltage of a cell, the ions could get stuck on the anode and eventually the cell could lose charge capability over time. This is partially why some, including Tesla’s CEO Elon Musk, have suggested that EV owners try to keep their batteries charged between 20 and 80 percent capacity. But Jaguar isn’t as worried about the durability of its batteries. Boulter told Jalopnik that Tesla directs its customers to limit daily charging in part due to the older design and slightly different chemistry of its battery cells, where keeping the battery at a higher charge could be potentially accelerate degradation. Jaguar claims it doesn’t need to recommend charging limitations for its EV customers based on its battery design. Jaguar anticipates that most owners will top up their cars overnight from their home, and will only have to worry about high voltage quick charging on longer, infrequent trips where the estimated 240 mile range isn’t enough. On paper, it seems like an obvious comparison to judge electric cars on how quickly they can charge. But Jaguar claims its research shows most people will not be concerned with quick charging times, and the benchmark of the time it takes to achieve 80 percent charge isn’t really an important factor for realistic daily use. But companies will start picking and choosing what sounds the most impressive as electric cars become more prevalent and as the technology advances, and our ability to understand how much power and performance these new vehicles are actually capable of will have to adapt. The good news is you can still be a car nerd for EVs. The bad news is it’s a lot more chemistry.